My son is in his second year in a Montessori preschool and this year he's really enjoyed the hand sewing projects in class. He started on a plastic canvas sewing project, spiraling in from the outside border. 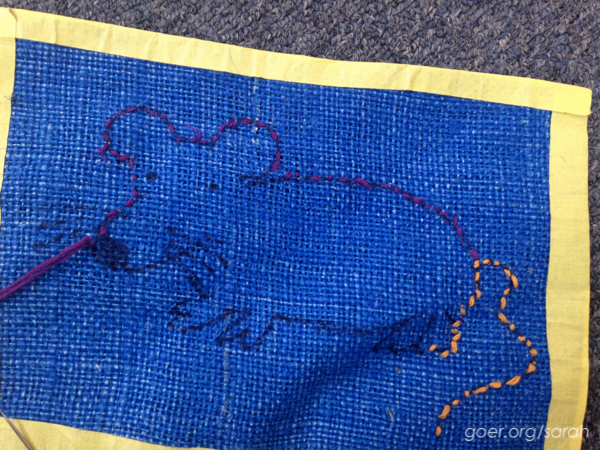 Then one of the teachers drew him a rat to stitch on burlap. And now he's working on sewing a teddy bear which I suspect is intended to become a pillow (no picture -- think two teddy bear shaped cutouts of woven fabric, sewing them together with regular needle and thread around the edge). Seeing how excited he's been about sewing I invited him to help me machine piece some seams on the drawstring bag I was making for my mother-in-law. He really enjoyed that. I asked him if he'd like to learn how to make a quilt and he was THRILLED! Step One: He raided my stash of fabric and selected a variety of animal prints. He's even decided on a friend who he intends to give it to. (Yes, it's kind of killing me that I don't get to keep his first quilt!) But I appreciate how excited he is to give this gift. We'll see how he's feeling once it's done. In the interest of keeping it simple, we'll be using 6" finished squares. I'll be making a small quilt alongside him so that I can show him the process with my blocks in an effort to let him do as much of his own sewing as possible. Step Two was to cut out all the squares. I did that myself, cause I'm just not so excited about handing a rotary cutter to a 4-year-old. :-) He hung out with me while I cut out the squares as I was not granted permission to do that step without him. That also meant that my 2 1/2-year-old daughter hung out with us. She enjoyed being "in charge" of the scraps of leftover fabric. Step Three: He meticulously laid out his 36 blocks in his own pattern. Not knowing in advance that there was going to be a pattern requiring multiples of 3 of the same print we had to pitch a few blocks and managed to find one more suitable fabric that I could get three squares out of. It happened to be my leftover fabric from making my daughter's pants. She was concerned that I was cutting up her pants. She kept telling me that she didn't want me to cut them, she wanted to wear them. Here's his final layout. Fabric and layout selected by my 4-year-old son. Now, since her brother got to "make a pattern" with his quilt squares, she naturally decided that she should get to make a pattern as well. So I let her choose the layout for my 35 blocks (I didn't manage to end up with 36 due to a flaw in one of my fabrics). She and I have a different idea of what "pattern" is, but I've decided to go with it. No idea what I'll be doing with this quilt. She won't be doing the sewing, so I think her contribution to our project ends here. Layout by my 2 1/2-year-old daughter. 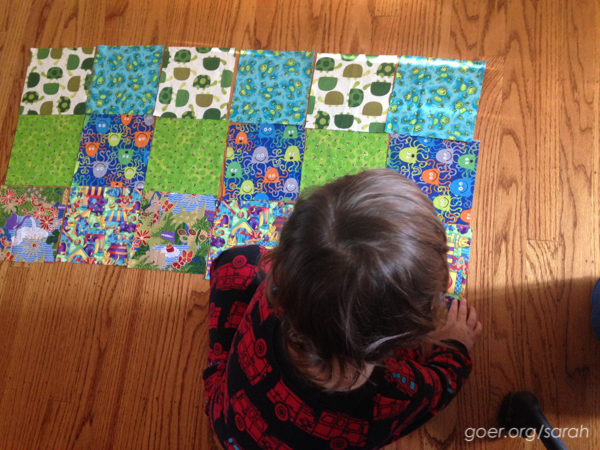 Have you taught a young child to quilt? Any tips? See how our project is going in Part 2 of this series. Posted in Quilting. 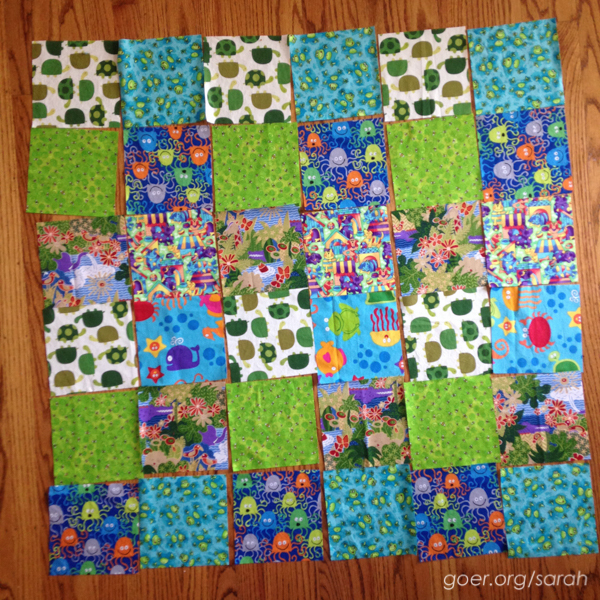 Tags: quilting with kids on January 5, 2015 by sarah. Ha! I love her "pattern". I can't wait to hear how his quilt develops. Thanks. Not sure if he'll have time to sew before the weekend. We'll see how it goes. My kids are all grownup and their kids aren't interested. I'm so excited that you are starting your son young. My older brother was mostly in charge of raising me many years ago and used to make me doll clothes. That may be where I started loving to stitch. Stay tuned. It's sure to be a bit of a wild ride. ;-) I was an only child for 8 years and spent a lot of time playing with the fabric scraps and buttons and such while my mom sewed (and worked in a sewing shop for a while... she sewed a ton, but only made one quilt in her life -- for me). I can't remember not sewing. I think my first official project way back when was making scrunchies. fun blog to read Sarah!! So glad your children are interested in learning to sew and now quilt!! Love the colors in your daughter's quilt!! Thanks, Bo. He also likes to have me make gifts for his friends' birthdays. It's nice to feel appreciated. My dad made an amazing crazy quilt that won a prize in the Marin Quilt Show awhile back. He also patched up his own Levis for years on the family Elna. I'm sure that your son (who shares my dad's name) will have a blast with his new hobby!! And I think your dear littlest designer will find many ways (choosing the quilting patterns? 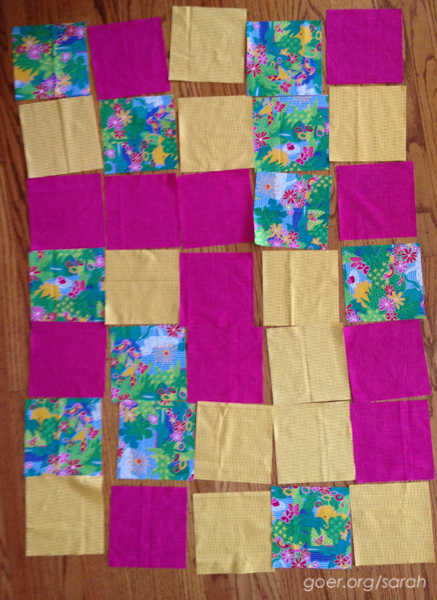 ), and perhaps new square arrangements, for her quilt to be just as vibrant as her brother's! Should be fun. Will definitely be an adventure! That's great about your dad's quilt. Congrats to him! You'll have to come to our guild's quilt show in March (the 14th and 15th). Lots of great stuff to see! My son started at 4 too. He wanted to do a bed size though! It's still a UFO, but he did start to sew on it again a couple of months ago. I kept getting frustrated because whenever I wanted to sew, one of my kids did too, and would take over my machine. We now have 3 machines. His was a used one off Craigslist for $50 - it turned out to be *exactly*! like mine, but with a nicer cabinet and barely used. Well, I owe him a bed-sized quilt (it's on the to do list), so maybe he'll help a little with that too. I do have the fear of sharing the sewing machine. My dad owns another of the exact machine I have, so if things get sticky here I'll be borrowing that from him. :-) Yay for kids who sew! I kind of take for granted that I learned to sew as a child, but I'm so glad I did! The two of you (well, the 3 of you) got a lot done. I'm so excited to hear about this quilt as you continue working on it with him. That so great that both kiddos are interested in quilting and creating. What a special gift you're giving them. Thanks, Sherry. I'm glad they are enjoying it. One of the benefits of sewing while they're around (and not just when they're at school/sleeping). How about making the quilt that your wee one laid out into a doll blanket? Does she play babies yet? Thanks. That's a great idea about my daughter's "pattern" though they are 6.5" squares, so it's big. She LOVES her babies. Maybe I have enough scraps of these fabrics (or I add a couple more) to make a baby blanket. Hm. You've got me thinking. Sarah you are an awesome mother! The Love just comes shining right through! You are going about this in a wonderful way. You really made me smile and laugh through the whole post.